If you purchase a Reserved Instance and you already have a running instance that matches the specifications of the Reserved Instance, the billing benefit is immediately applied. You do not have to restart your instances. If you do not have an eligible running instance, launch an instance and ensure that you match the same criteria that you specified for your Reserved Instance. For more information, see Using Your Reserved Instances. Reserved Instances apply to usage in the same manner, irrespective of the offering type (Standard or Convertible), and are automatically applied to running On-Demand Instances with matching attributes. Reserved Instances assigned to a specific Availability Zone provide the Reserved Instance discount to matching instance usage in that Availability Zone. For example, if you purchase two c4.xlarge default tenancy Linux/Unix Standard Reserved Instances in Availability Zone us-east-1a, then up to two c4.xlarge default tenancy Linux/Unix instances running in the Availability Zone us-east-1a can benefit from the Reserved Instance discount. The attributes (tenancy, platform, Availability Zone, instance type, and instance size) of the running instances must match that of the Reserved Instances. Regional Reserved Instances are purchased for a Region and provide Availability Zone flexibility. The Reserved Instance discount applies to instance usage in any Availability Zone in that Region. Regional Reserved Instances also provide instance size flexibility where the Reserved Instance discount applies to instance usage within the instance family, regardless of size. Instance size flexibility only applies to Reserved Instances that use the Amazon Linux/Unix platform with default tenancy. Instance size flexibility is determined by the normalization factor of the instance size. The discount applies either fully or partially to running instances of the same instance family, depending on the instance size of the reservation, in any Availability Zone in the Region. The only attributes that must be matched are the instance family, tenancy, and platform. Instance size flexibility is applied from the smallest to the largest instance size within the instance family based on the normalization factor. The table below describes the different sizes within an instance family, and corresponding normalization factor per hour. This scale is used to apply the discounted rate of Reserved Instances to the normalized usage of the instance family. For example, a t2.medium instance has a normalization factor of 2. 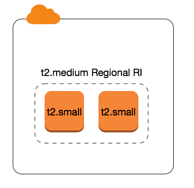 If you purchase a t2.medium default tenancy Amazon Linux/Unix Reserved Instance in the US East (N. Virginia) and you have two running t2.small instances in your account in that Region, the billing benefit is applied in full to both instances. Or, if you have one t2.large instance running in your account in the US East (N. Virginia) Region, the billing benefit is applied to 50% of the usage of the instance. The normalization factor is also applied when modifying Reserved Instances. For more information, see Modifying Reserved Instances. Instance size flexibility also applies to bare metal instances within the instance family. If you have regional Amazon Linux/Unix Reserved Instances with shared tenancy on bare metal instances, you can benefit from the Reserved Instance savings within the same instance family. The opposite is also true: if you have regional Amazon Linux/Unix Reserved Instances with shared tenancy on instances in the same family as a bare metal instance, you can benefit from the Reserved Instance savings on the bare metal instance. A bare metal instance is the same size as the largest instance within the same instance family. For example, an i3.metal is the same size as an i3.16xlarge, so they have the same normalization factor. If you have one running i3.16xlarge in your account in that Region, the billing benefit is applied in full to the i3.16xlarge instance (i3.16xlarge normalization factor = 128). Or, if you have two running i3.8xlarge instances in your account in that Region, the billing benefit is applied in full to both i3.8xlarge instances (i3.8xlarge normalization factor = 64). Or, if you have four running i3.4xlarge instances in your account in that Region, the billing benefit is applied in full to all four i3.4xlarge instances (i3.4xlarge normalization factor = 32). The opposite is also true. For example, if you purchase two i3.8xlarge default tenancy Amazon Linux/Unix Reserved Instances in the US East (N. Virginia), and you have one running i3.metal instance in that Region, the billing benefit is applied in full to the i3.metal instance. The following scenarios cover the ways in which Reserved Instances are applied. The discount and capacity reservation of the four m3.large zonal Reserved Instances is used by the four m3.large instances because the attributes (instance size, Region, platform, tenancy) between them match. 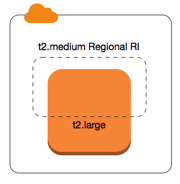 The m4.large regional Reserved Instances provide Availability Zone and instance size flexibility, because they are regional Amazon Linux Reserved Instances with default tenancy. An m4.large is equivalent to 4 normalized units/hour. You've purchased four m4.large regional Reserved Instances, and in total, they are equal to 16 normalized units/hour (4x4). Account A has two m4.xlarge instances running, which is equivalent to 16 normalized units/hour (2x8). In this case, the four m4.large regional Reserved Instances provide the billing benefit to an entire hour of usage of the two m4.xlarge instances. The c4.large regional Reserved Instance in us-east-1 provides Availability Zone and instance size flexibility, because it is a regional Amazon Linux Reserved Instance with default tenancy, and applies to the c4.xlarge instance. A c4.large instance is equivalent to 4 normalized units/hour and a c4.xlarge is equivalent to 8 normalized units/hour. In this case, the c4.large regional Reserved Instance provides partial benefit to c4.xlarge usage. This is because the c4.large Reserved Instance is equivalent to 4 normalized units/hour of usage, but the c4.xlarge instance requires 8 normalized units/hour. Therefore, the c4.large Reserved Instance billing discount applies to 50% of c4.xlarge usage. The remaining c4.xlarge usage is charged at the On-Demand rate. Reserved Instances are first applied to usage within the purchasing account, followed by qualifying usage in any other account in the organization. For more information, see Reserved Instances and Consolidated Billing. For regional Reserved Instances that offer instance size flexibility, the benefit is applied from the smallest to the largest instance size within the instance family. The discount of the four m4.xlarge Reserved Instances is used by the two m4.xlarge instances and the single m4.2xlarge instance in account A (purchasing account). All three instances match the attributes (instance family, Region, platform, tenancy). The discount is applied to instances in the purchasing account (account A) first, even though account B (linked account) has two m4.xlarge that also match the Reserved Instances. There is no capacity reservation because the Reserved Instances are regional Reserved Instances. The discount of the two c4.xlarge Reserved Instances applies to the two c4.xlarge instances, because they are a smaller instance size than the c4.2xlarge instance. There is no capacity reservation because the Reserved Instances are regional Reserved Instances. In general, Reserved Instances that are owned by an account are applied first to usage in that account. However, if there are qualifying, unused Reserved Instances for a specific Availability Zone (zonal Reserved Instances) in other accounts in the organization, they are applied to the account before regional Reserved Instances owned by the account. This is done to ensure maximum Reserved Instance utilization and a lower bill. For billing purposes, all the accounts in the organization are treated as one account. The following example may help explain this. The discount of the m4.xlarge zonal Reserved Instance owned by account C is applied to the m4.xlarge usage in account A. The discount of the m4.xlarge regional Reserved Instance owned by account A is applied to the m4.xlarge usage in account B. If the regional Reserved Instance owned by account A was first applied to the usage in account A, the zonal Reserved Instance owned by account C remains unused and usage in account B is charged at On-Demand rates. For more information, see Reserved Instances in the Billing and Cost Management Report.